1933 | Buried words and Bushwa. Happy 165th birthday Bram Stoker. 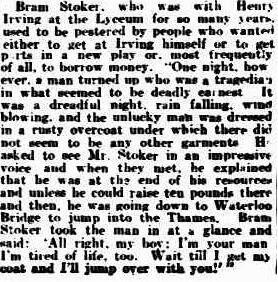 Today is Bram Stoker‘s 165th birthday so I thought I would sneak in this amusing story about him as an extra post in celebration. Reportedly Bram was often pestered by people for money, parts or contacts, and on the stormy night in this tale he was approached for money by a desperate man seemingly dressed in nothing more than a rusty overcoat. The man told Bram that he was at the end of his resources and if he didn’t get ten pounds right then he would jump off Waterloo Bridge and into the Thames. Once I started reading I loved the description of them as ‘herds menacing the grass lands…’. Naturally that immediately bought to mind huge, fast-moving beasts with wide, chomping mouths ravaging the countryside, crowds of farmers fleeing before them. I expect the reality was smaller and slower. Much, much slower. Less screaming too. 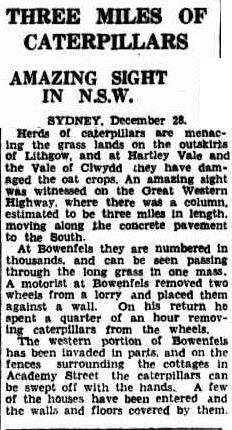 I know that something like this is no laughing matter for farmers but the description of three miles of them creeping along the concrete pavement along the side of the Great Western Highway could have probably been responsible for a few car accidents! I love the thought of this deadly monster. The explorer Mr. Richard Hamilton (conveniently a film producer too, no self promotion in this article is there) is going to spend a month trekking into the jungles of Upper Kenya and brave THE WORST PERILS in order to save the natives from the man-killing Nandi bear. I’m not sure why he is bothering though. For one, a month is hardly enough time to have a good look around in your average jungle, is it? Lucky he is picking up those two white hunters that will help him in his travels…. I wonder if they get paid, monster or no monster? Secondly, according to this article, the jungle is haunted by spooks, and all who enter it are believed to be doomed. Even if he gets rid of the Nandi bear I doubt that the locals will be queueing up to make their home in such an uninviting place. Rumour has it that the Nandi bear was as big as a polar bear and would drop from the trees onto its victims. Can you imagine something the size of a polar bear dropping from the trees onto your head? No wonder that article also says no-one has yet seen this animal. Hardly surprising. The last thing anyone who has encountered this creature saw was 300+kg of death falling from above. You are not likely to crawl out from under that and run home to tell your family, are you? If no-one has seen it how do they know what is lurking in the trees? Could an animal that size actually conceal itself in the foliage? Wouldn’t the creaking of branches give away its position long before any dropping could occur? Here in Australia we have a much smaller version of this frightening creature, the Drop bear (Thylarctos plummetus)*. It is a carnivorous koala-like creature that waits in the trees for unsuspecting travellers to walk under before dropping onto their heads and, well, eating them. 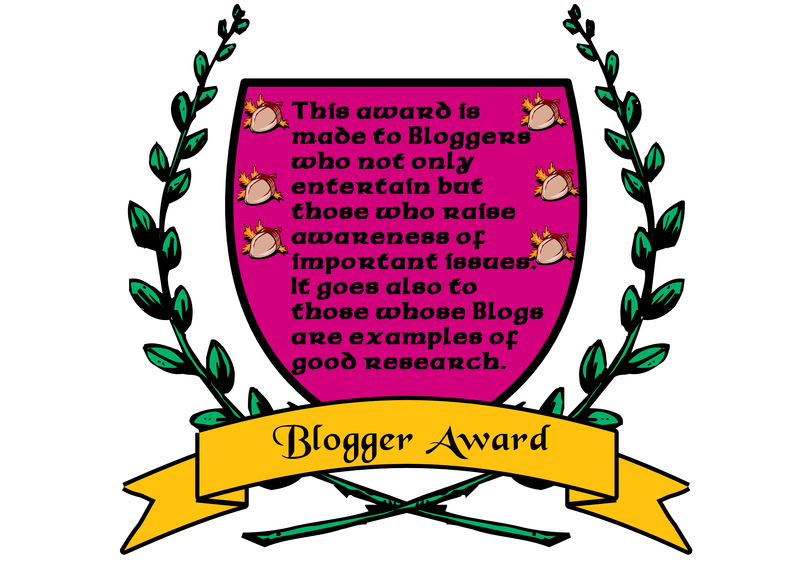 *This is a great link from the Australian Museum. If you have a look, please read the comments. There will be a lot of scared people out there…..
A memorial regenerated. The Lone Pine, Melbourne. Near central Melbourne we have The Shrine of Remembrance, a memorial built to remember those who fell during World War I. It has now come to represent all those who have fallen defending our country and is affectionately and simply known as the Shrine. In the grounds of the Shrine, called King’s Domain, there are various kinds of memorials to different aspects of war. One of these is the Lone Pine. During the Battle of Lone Pine, one of the bloodiest battles of the Gallipoli peninsula, during which thousands of Turks and Australians died, the one remaining pine tree on the ridge was blown apart. 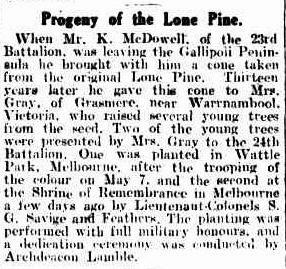 Cones from this tree were bought back from the battlefield by soldiers who fought there, and later a seedling raised from the one bought back by Sergeant McDowell of the 23rd Battalion was planted in the grounds of the Shrine in 1933 in memory of that terrible battle. *If you look at the wikipedia entry for the Shrine you will see just how special it was historically. Under the ‘construction and dedication’ heading there is a small aerial photo taken at the time of the dedication ceremony in 1934. The caption reports that 300,000 people attended. That was one-third of Melbourne’s population at the time. As soon as I read this article the first thing I thought of was a group of rogue tooth fairies, hauling away sacks of teeth, convinced they had struck it rich. 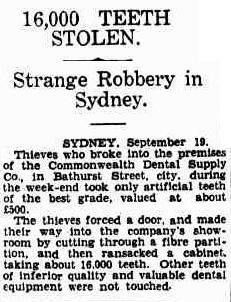 I can imagine some thieves trying unsuccessfully to sell artificial teeth at the pub of a weekend. Where do dentists drink anyway? Is there a market for hot, fake teeth? The second thing that popped into my mind were the millions of belief-controlling teeth in Tooth Fairy’s castle in Terry Pratchett’s book, The Hogfather, so, thanks thieves for giving me an excuse to add in a clip from the movie. Death and his Granddaughter, Susan (read the books, long story) have just restored the Hogfather, and in doing so saved an entire beliefs system. In the clip Death is explaining exactly why human belief in the little things, like Tooth Fairies and Hogfathers, is important. Some strange finds. 1937 and 1933. 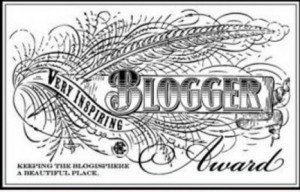 A few small articles for you today. I couldn’t resist sharing these snippets of strangeness I found. I love the things that used to make it into the newspapers. 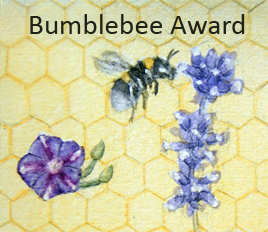 In the first case it is an article about a large bee hive in the ceiling of a soon to be demolished house. It contained both 30lb+ of honey and also, interestingly contained two doves eggs surrounded by wax. This second article is stranger though. A doctor found a number of genuine pearls when operating on a patient. Wow! Real pearls! 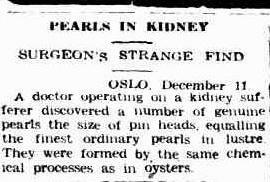 I wonder how many times actual pearls have been found inside a persons kidneys? Do you think that maybe these pearl-like things were just smooth and shiny kidney stones? I really hope that they were never set into jewellery…. ick….